Practical design of both a deep plate and a bowl makes it suitable both for serving and eating from. 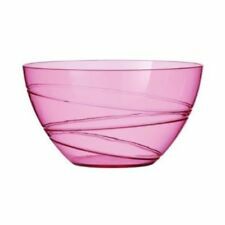 Made of glass making the bowl resistant and durable. Smart design allows it to be stacked on top of each other to save space. Lovely retro vintage fruit or salad bowl. Great condition. This classic piece features a pierced stainless steel design inspired by cacti. The bowl is marked to the bottom “Alessi Italy INOX 18/10 M. Sansoni 2002.”. Botanic Garden is decorated with enchanting illustrations that are reminiscent of spring in full bloom. Beautifully crafted from crisp white ceramic, brought to life in spectacular detail, the Botanic Garden range will bring all of the colours and life of the outdoors inside with you…and onto your dining table. Black Blum’s funky new Fruit Loop Fruit Bowl will throw you for a loop! You’d be loopy not to! Fruit Loop Bowl features CHANGE OF MIND. Any fees or duties are the responsibility of the recipient and cannot be reimbursed be Peter's of Kensington. 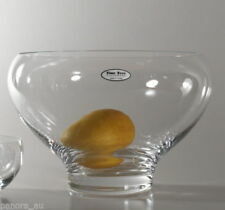 Devon Cotton Fruit/Salad Bowl Set features 1 x 21cm Salad Bowl. This revamped English Country Classic brings a sense of the good things about country living to any urban setting embodied in this Salad Bowl. 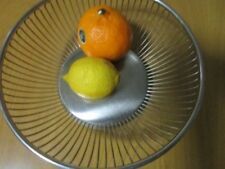 Lucky Wood Citrus Fruit Bowl Florence Pattern Japan Stainless Vintage ca.1960. bowl approx 10cm plate approx 17cm bowl fixed to plate Set of 2 with matching spoons Condition is Used. This is a MAXWELL & WILLIAMS TUSCAN FRUIT BOWL LARGE 27 CM ACROSS. HAPPY COLLECTING! High quality blue with yellow lemons painted on a ceramic fruit bowl. 33cm wide and 7cm tall this is a centre piece for the table beautiful in the light. Model No: B1204. 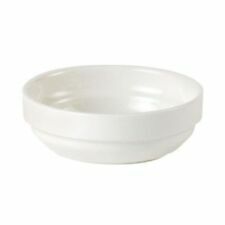 - These lovely serving bowls are strong, durable and lightweight. Colour: Bright gold. - Makes food presentation sparkle when serving. Quantity: 4 bowls/set. We will do our best to solve the problem. Bamboo chassis, stainless steel basket. A beautiful fruit basket can demonstrate the quality of life. Easy to install and clean. Related Product (Yummy Smile Spoon&Fork Blue) --------------------. Handle bowl~. splinterless~. Eating Is Fun! BEACHSIDE SCENE BEACH HOUSE, LIGHT HOUSE,BOAT, PALM TREES. MULTI COLOURED - WHITE, LIGHT & DARK BLUE, AQUA, YELLOW,GREEN,RED. BOWL- FRUIT,SNACKS. This hand made, hand decorated ceramic cherry dish/bowl stands approx. 10cm tall and is approx. 13cm wide (at the top rim of the dish) It's decorated in red underglaze with a clear glaze over the top, and can be used as a decorative or functional item. Model: B1004. - These lovely serving bowls are strong, durable and lightweight. - Makes food presentation sparkle when serving. Color: Bright gold. Quantity: 4 bowls/set. We will do our best to solve the problem. Can collect from Banora point near Tweed Heads. Hand turned Pine wooden bowl with Rosewood stain. Every bowl is original. Can a range for local pickup. Easy to clean. Hand turned Pine and Cyprus wooden bowl. Easy to clean. LARGE STUNNING BLUE & BEIGE Australian "T" STONEWARE BOWL. QUALITY PIECE - FANTASTIC CONDITION. Available to be picked up from Marrickville, Sydney. This sale is for ajohnson bros fresh fruit sugar or dip bowl in good condition. 10.7cm dia 7cm tall. All china and glass wrapped in bubble wrap. Can collect from Banora point near Tweed Heads. Hand turned Pine and Oregon wooden bowl. Every bowl is original. Can a range for local pickup. Easy to clean. Artesano Original is German-made from premium porcelain, for pieces that are robust yet appear delicate pure. Artesano Original Fruit Bowl features Renowned for their fine quality, beautiful designs and exquisite porcelain, Villeroy and Boch have thrived through the ages, taking themselves from France to Luxembourg to master their skills. Astoria Mint Fruit Bowl features Costa Nova dinnerware is made in Portugal, crafted from the finest quality stoneware and finished to absolute perfection. With its rugged good looks, Costa Nova dinnerware lets you set your table in classic style. Hand turned Pine Tasmanian Oak and Oregon wooden bowl. Every bowl is original. Can a range for local pickup. Easy to clean. 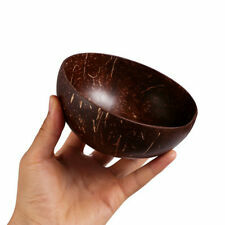 You are viewing a beautifully hand crafted and turned Swamp Mahoghany "Eucalyptus" Wood Fruit or Salad Bowl. This is a very heavy piece for its size and it has been signed by the artist on the base which reads "P. Levick - Swamp Mahoghany". Best used with a citrus spoon. Doubles up well as quacamole dip dish. If you want to make a good impression, Costa Nova’s Impressions range of gorgeous dinnerware and bakeware is just what you’re looking for! Costa Nova dinnerware is made in Portugal, crafted from the finest quality stoneware and finished to absolute perfection. Ideal for fruit. Quality, solid bowl. Minimal use. In excellent condition- like new. Size approx. 33.5 cm across top. Every bowl is original. Can a range for local pickup. Easy to clean. Height 13cm Width 25cm x 25cm. Led-free handmade high quality clear square glass bowl. Polished edges. Mid Century BUTTERFLY JAPAN FINE CHINA. QUALITY PIECE - FANTASTIC CONDITION. Available to be picked up from Marrickville, Sydney. Hand turned Tasmanian Oak, Rosewood stained wooden bowl. Every bowl is original. Can a range for local pickup. Easy to clean. Would make nice Christmas gift. Approx 45cm by 33cm. You are viewing a set of 2 Wooden Hand Painted Folk Art Pig Dishes, Plates or Bowls. These have been made by sawing 3 pieces and joining them together into a stepped bowl, then hand painted in a flesh colour base with black spots. Maybe you could use it for a desert bowl, trifle or puddings. Maybe a place to chuck the keys and coins and to keep the kitchen bench tidy. The possibilities are endless. Well look no further. This lovely serving fruit bowl, is just what you need. Pre-owned but never used and is in as new condition, not boxed. Hand turned Pine wooden bowl. Every bowl is original. Can a range for local pickup. Easy to clean.